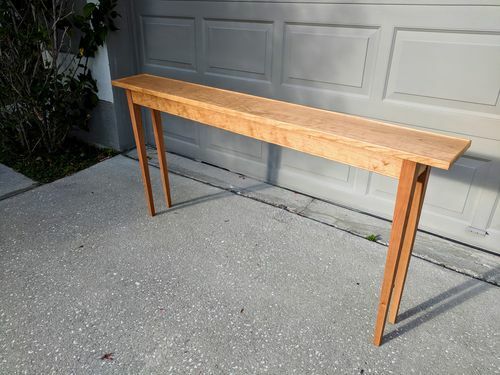 I don’t usually sell my woodworking pieces. I normally give my pieces as gifts to people who mean a lot to me. So this will be my very first commission piece. 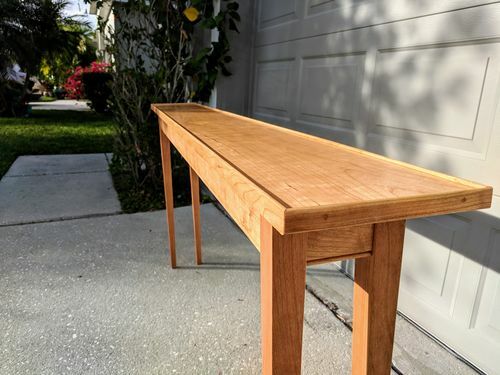 Woodworking is my hobby and passion, the last thing I want is for it to feel like a job, but Kay is a sweet lady and this is a piece that I really enjoyed building for her. 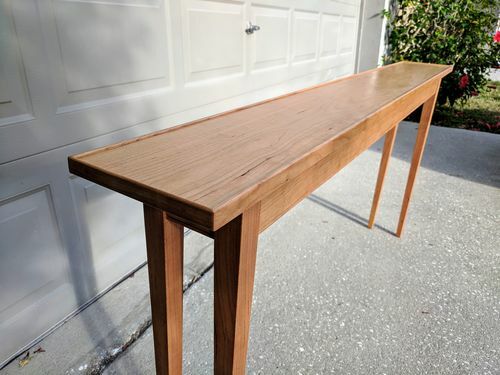 The table is made from Cherry. 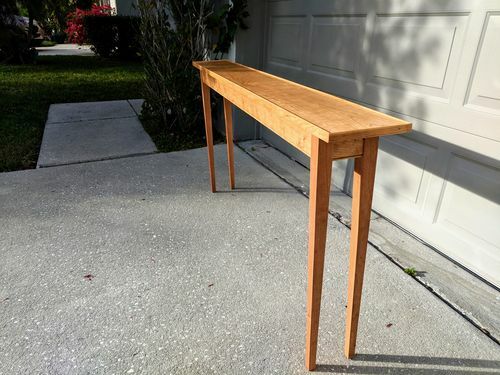 It’s 5 feet long, just about 8 inches wide, and 29 1/2 inches tall. The legs are 1 1/2” square at the top and taper down on two sides to 7/8” at the foot. The aprons are 3” and feature a bead detail along the bottom. There is a 1/4” roundover molding around the tabletop that sits 1/8” proud of the surface . 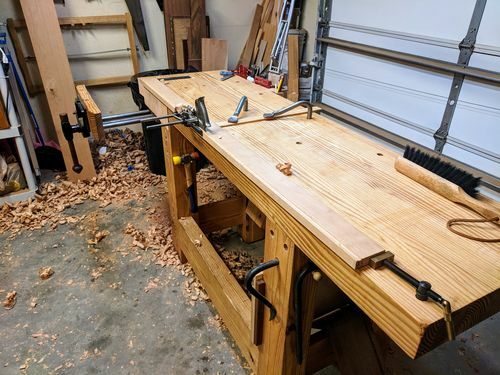 Hand tools only, mortise and tenon construction, and based on the Shaker style. 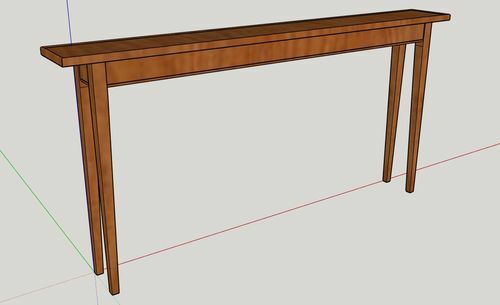 I begin most all of my projects in SketchUp. I have to build it completely digitally to get it into my head before I put blade to wood. 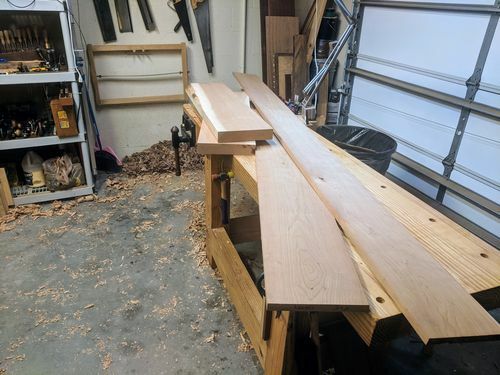 My hardwood dealer sells 4/4 and 8/4 Cherry Walnut and Maple Sanded 3 and 4 sides as well as rough sawn, because I only use hand tools I get the sanded options most often. 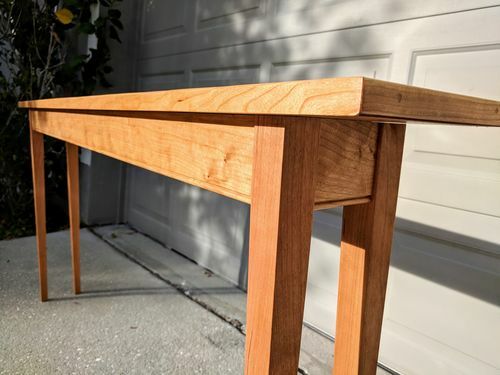 This is about $150.00 worth of sanded Cherry. The 8/4 is about 1 7/8” thick and I marked out the 1 1/2” legs over-sized. 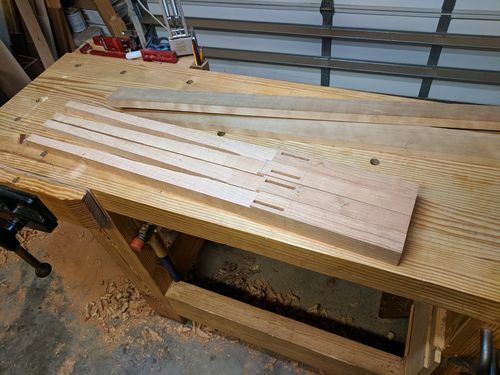 I got the leg stock from the edges in order to get rift sawn staight grain leg stock. I start the kerf with a short panel saw. 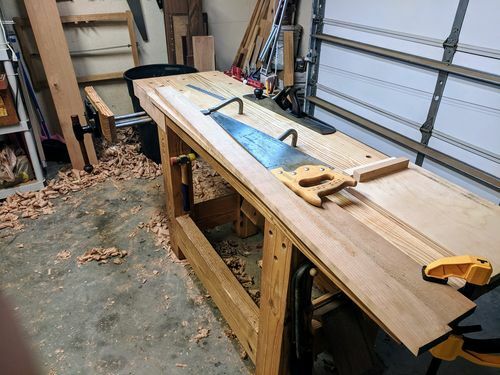 I continue the cut with my frame saw. This happened to be the widest cut I can make with this saw. 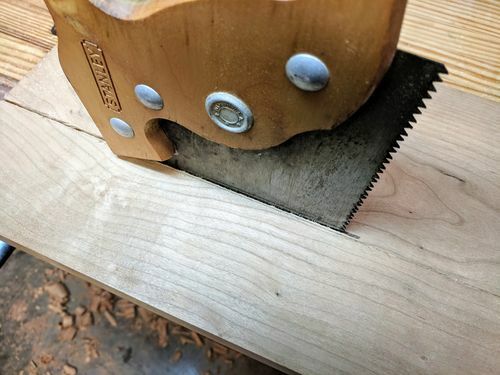 Whenever I’m rough cutting stock for a new project I always collect a good amount of fresh saw dust from the stock I’m working with, just in case I need a bit of filler later on. 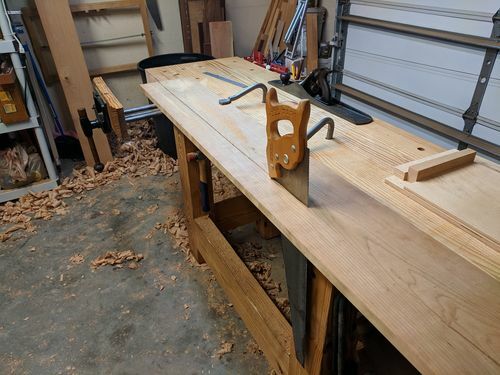 A 19” wide vise chop and a #7 jointer plane are a perfect combination to bring a sawn edge right down to the marking gauge line. After flattening and squaring the leg stock I decide which ones will be the front legs and which will be the back, lefts and rights as well. 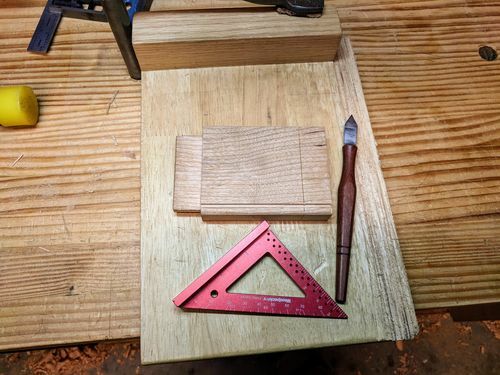 I use a cabinet makers triangle marked on the end grain to keep things in order. 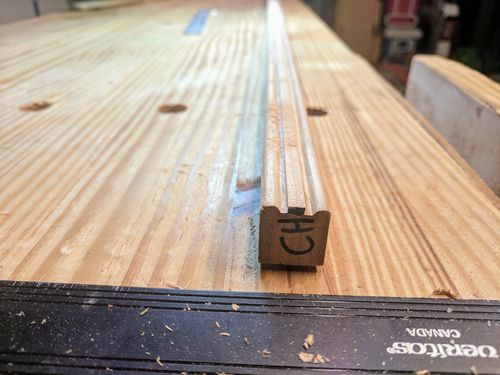 I also mark lines to remind me where the tenons need to be cut. 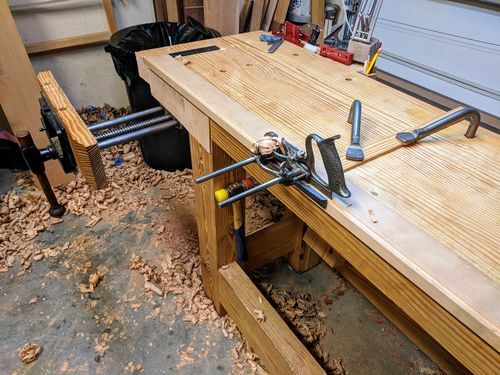 At this point the legs are left way extra long to prevent blowing out the end grain when cutting the mortises. 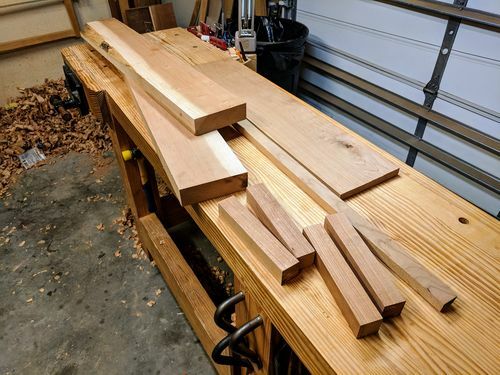 All four legs are lined up and clamped together, a knife line is marked about 1/4” from the end for the foot of the legs, and then I measure the exact leg distance from that knife line to the final length and mark all of the legs. All four are marked at the same time. 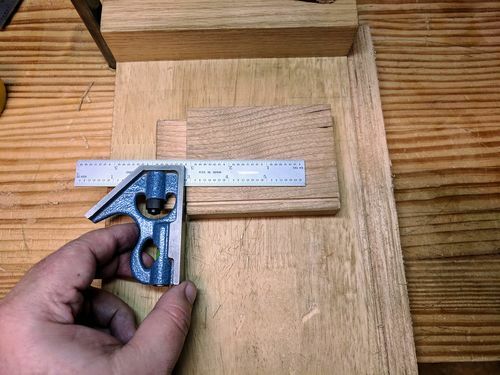 I mark out the mortises with my Veritas mortise gauge and cut the mortises using my 1/4” mortise chisel. 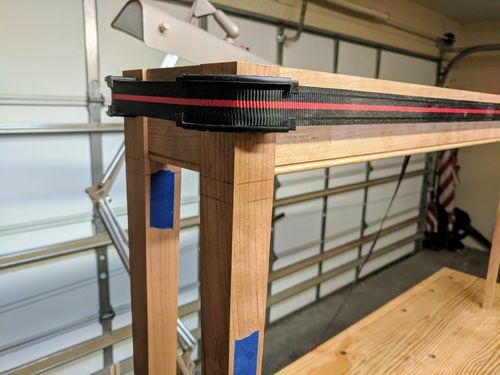 I make sure to allow for the 1/8” offset I want from the edge of the leg to the edge of the apron. BTW, I originally planned for a smaller apron and this picture shows a pretty short mortise. They will be longer later in this process. 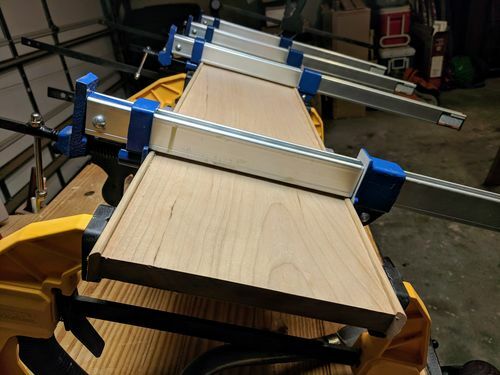 I have the 9” wide 4/4 board clamped to my benchtop with my Gramercy Hold Fasts. 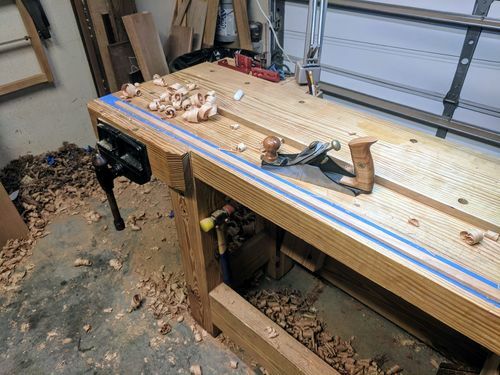 I’m using the overhand ripping technique from Cristopher Schwarz to cut out the aprons from either side of this board to have staight grain boards and leave the cathedrals as waste. I stay as close to the line as I can as long as I don’t cross it. Once I’m done with the aprons I move back to the legs. 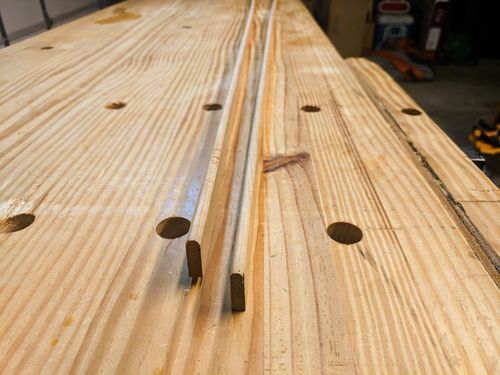 The two inside faces of these legs will taper from 1 1/2” square down to 7/8” square. 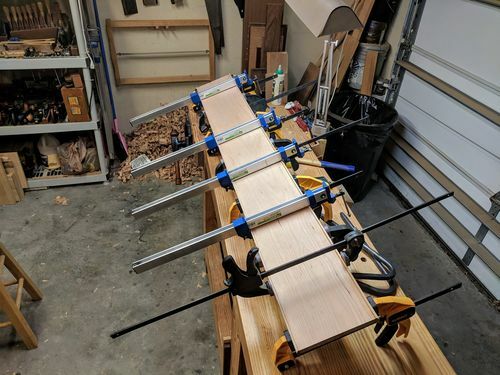 A lot of tapers are cut on the band saw where the off-cut is taped back onto the original piece to allow for an easier cut of the second side. 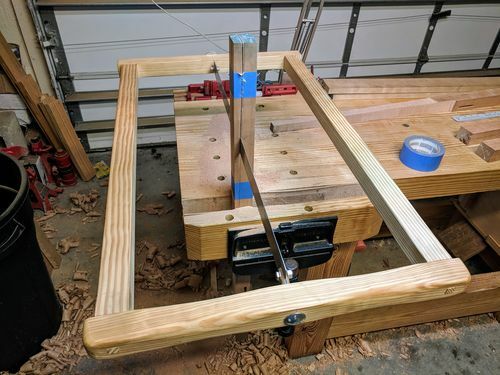 The same process is used with my frame saw. I cut the first taper and then tape back on the off-cut for the second cut. 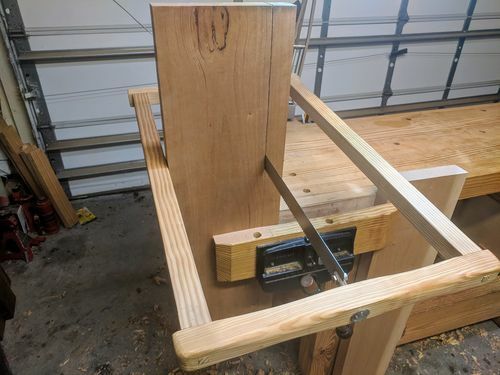 It may be hard to see in these pictures, but I also angle the piece in the vise so my cut is verticle which is easier than trying an angled cut. At this point the aprons and the legs have been rough cut with saws. From here I will hand plane the legs to there final dimension at the top and then plane the tapers to final size. 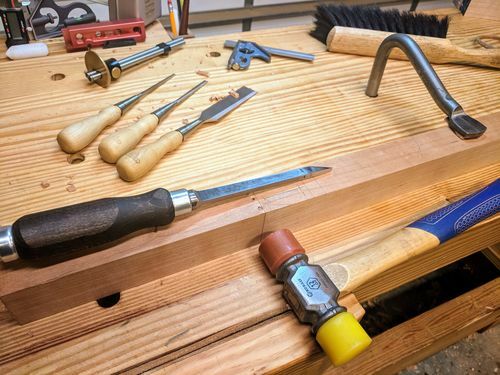 The taper starts 1/2” down from the end of the mortise. 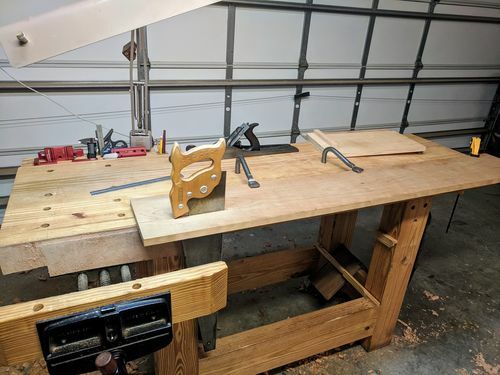 I’ll start with a scrub plane and then move on to a #7 jointer plane. Later in the process I’ll finish it off with a 4 1/2 smoothing plane. 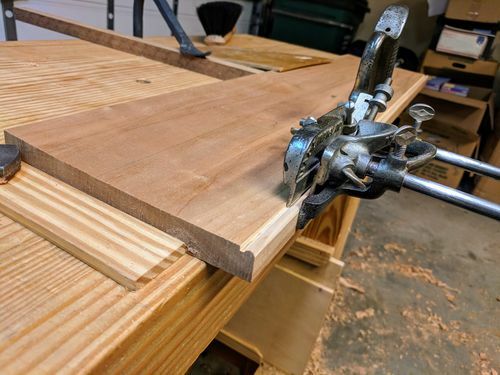 The edge and end aprons are still connected as long boards and now is the perfect time to cut both the groove needed on the back to attach the tabletop, and then the decorative bead detail on the face of the aprons. 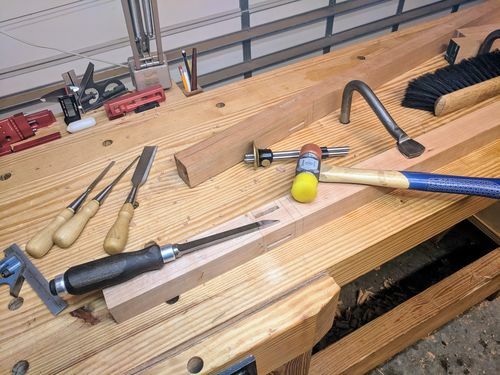 I do not have an end-vise on my bench, but I find that a Wonder Pup from Veritas works very well for these cuts. 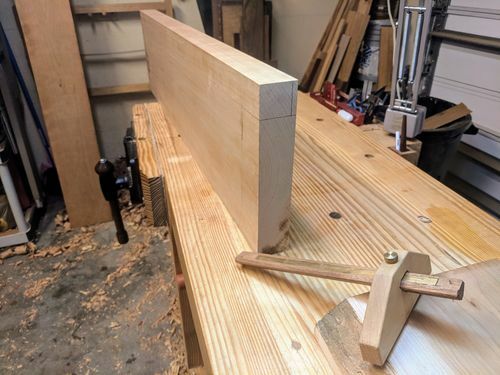 I also needed to open my face-vise all the way out to allow for this length of board. 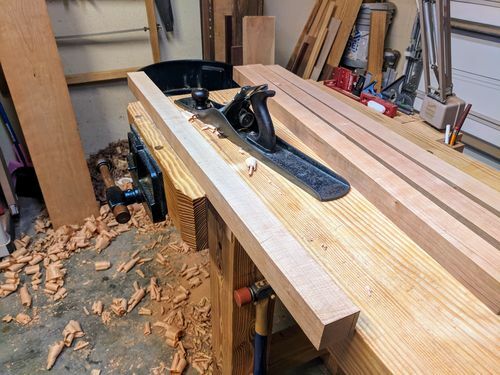 I found early on in my hand tool work that a plow plane is one of those tools that is indispensable. This is a Record #050, it’s exactly like a Stanley #50 small plow plane. 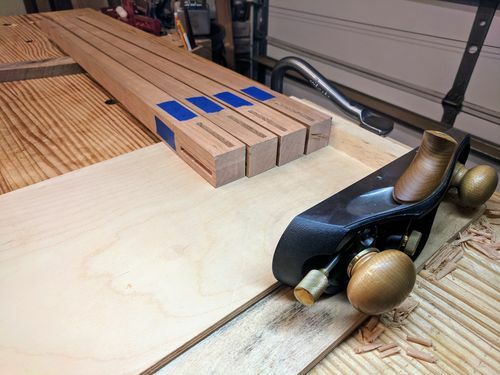 This one is what they call a combination plane because it has beading cutters, tongue and groove cutters, and the straight groove cutters too. 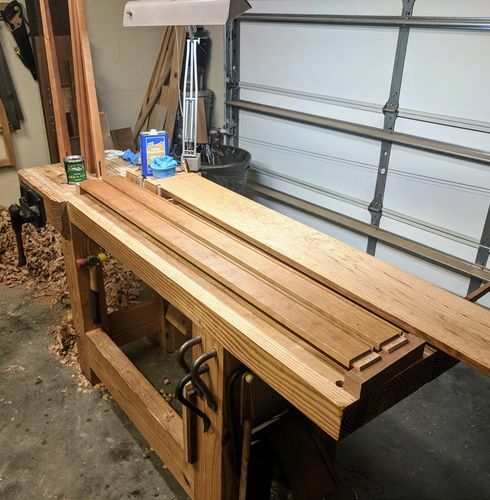 At this point I have cut off the two end aprons (they are very short) and left them a little over-sized including the tenons. 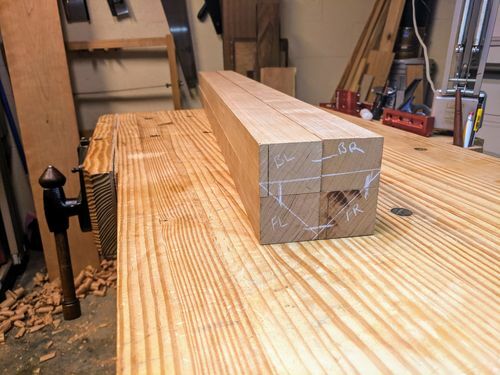 The first tenon is marked exactly 7/8” from one of the edges and then sawn out. I start with sawing the shoulder cut first with my cross-cut tenon saw. 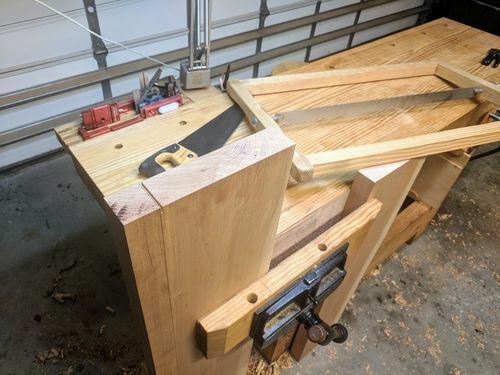 I then use my rip-cut tenon saw to cut down the faces of the tenons. 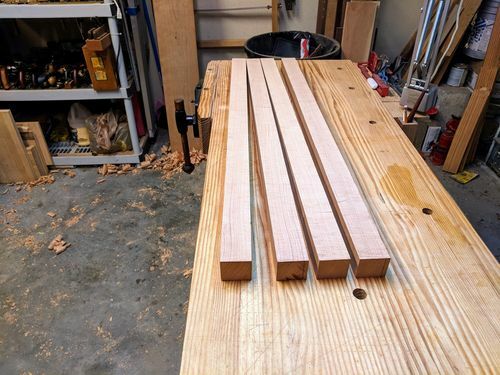 After the first tennon is cut I set a combo square to the exact length needed, from there I can mark out and cut the other end. 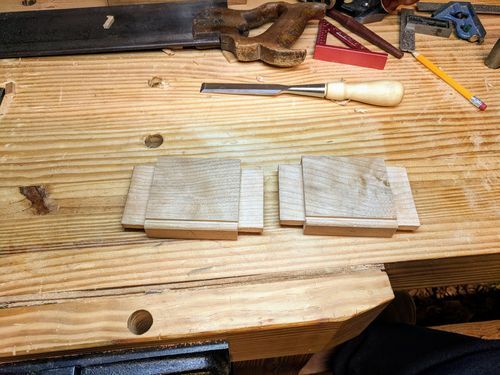 Before I start fitting the tenons and because I designed the aprons to set back 1/8” from the edge of the legs, I set my router plane to exactly 1/4” and cut the show face of all eight of the tenons (both long and short) at the same time without changing that setting. 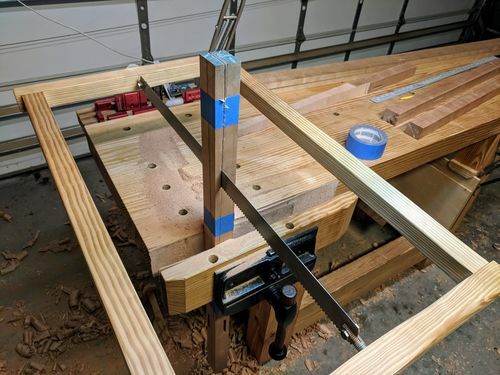 Once I begin actually fitting the tenons to the mortises I’ll adjust the router plane and slowly trim down the back of the tenons only, and never touch the face side again. This will maintain the desired offset on the face side of the legs and aprons. Note In this picture you will notice a lot of tear out. This will be scraped and sanded away later in the build. 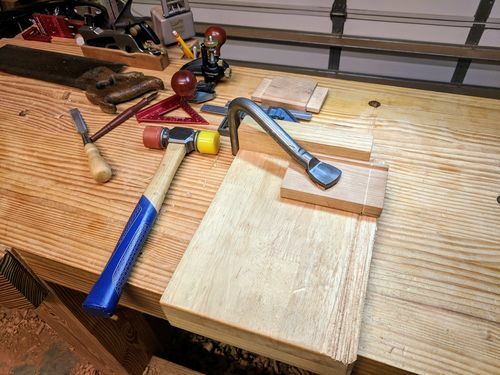 I slowly adjust the router plane until the tenon fits snugly, but does not slip out on it’s own. 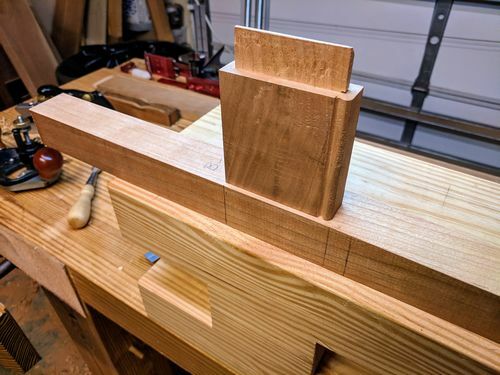 I also trim the top of the tenon to exacly 1/4” down from the top, and then cut the lower end of the tenon to fit the mortise. 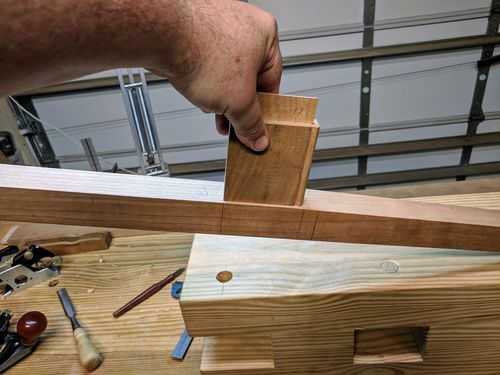 After all of the tenons are cut and fitted I chamfer the ends of the tenons because of how close they end up to each other inside the leg stock pieces. In this picture you can also see that the feet of the legs still have not been trimmed to size. That’s the next step. I saw the foot side to the line and then clean-up on the shooting board. I then saw the tops of the legs to their final size and clean them up with the shooting board. 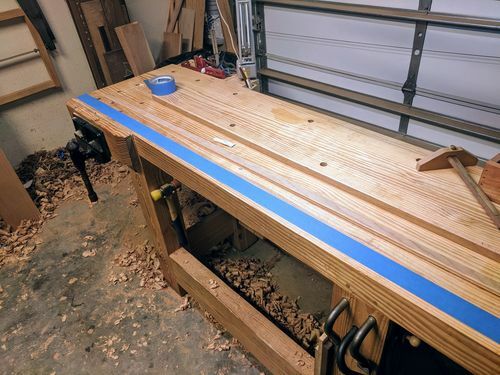 The marks I made earlier are removed in this step and so you will notice I have added blue tape to maintain those marks. 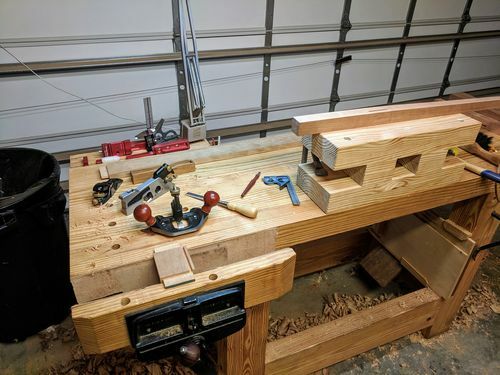 Time for a dry fit to make sure everything fits and clamps-up square. This shot really shows how nice the bead detail looks. It also show some of the pencil marks that will be lost after the final smoothing and clean-up. Earlier in this post I cut the aprons out of a wide board and left the cathedral parts of the board as waste. 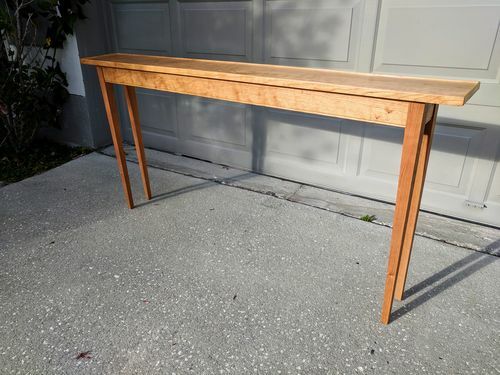 I need a round-over molding to go around the tabletop and I used this waste piece to make this molding. The next step for the molding is to cut the two pices apart. Back to the frame saw for this cut. 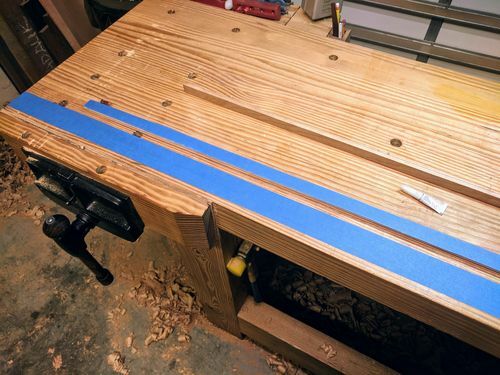 Blue tape is added to the benchtop and another piece to the molding piece. 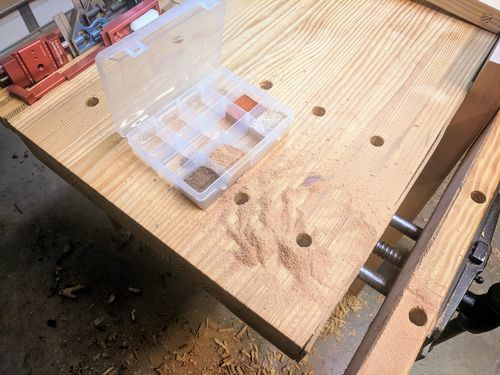 I use the Scrub plane and then then the #7 Jointer plane to bring the molding down to the 1/4” thickness needed. 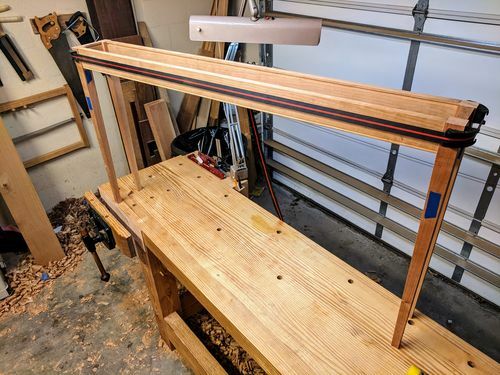 When I’m done planing the tape is easily removed with no damage to the bench or the strip. This Stanley #4 has been converted to a scrub plane with a heavily cambered iron and a wide open mouth. 1/4” wide and 7/8” tall with a 1/4” round-over on the top. These pieces will be trimmed to size and a 45 degree chamfer will be added to each so they fit around the tabletop. 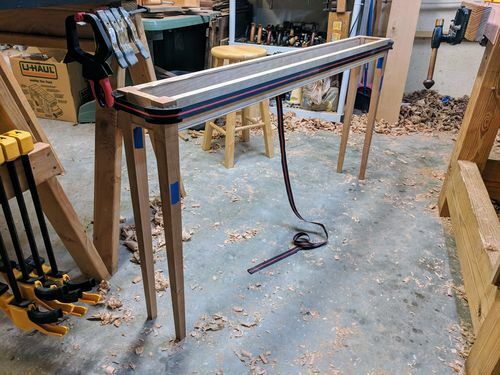 The long grain pieces are glued to the tabletop. We all need more calmps!!! 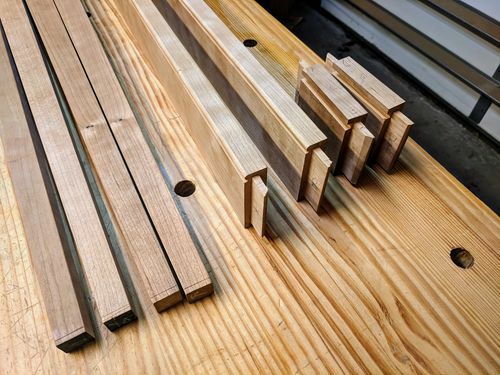 The moldings on the ends will be trimmed to fit and attached with very small finish nails but no glue, to allow for seasonal movement. All the parts are done and I spend a lot of time cleaning them up and smoothing things out. I apply finish to these parts before I glue them up. It’s easiers this way. Arm-R-Seal Satin Topcoat. 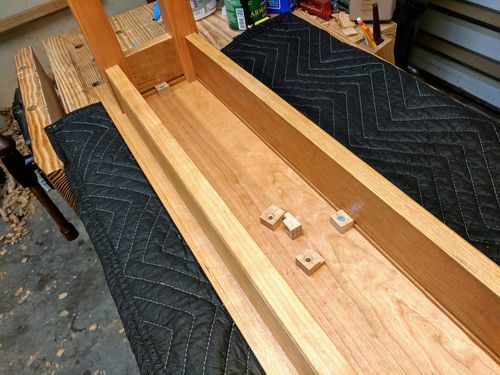 Three coats for most of the parts but six coats to the tabletop itself. 6 to 8 hours and a light 400 grit hand sanding between coats. I’ve affixed the tabletop to the base using shop made buttons that fit into the groove on the backside of the aprons. One more very light coat of finish, then some furniture wax and we’re all done with this project. This is what Ive got left over as waste. I hope you found it as enjoyable as I did making it. If you have any questions or comments just leave them below and I’ll be happy to answer them. Nice description of the build and a beautiful result, Tim! I especially like the blue-tape and super-glue trick for thicknessing the moulding pieces. Outstanding job! Thanks for all the extra pictures so I can fully understand the build! 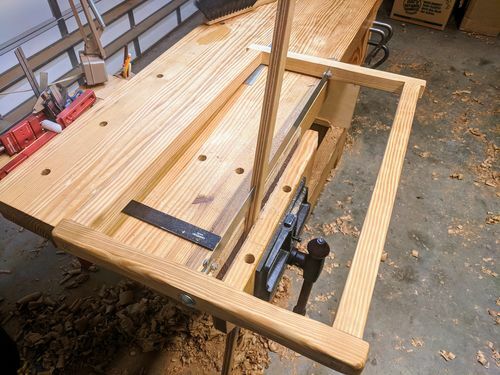 You could be a woodworking teacher. Great job on the step by step. love hand tool work. A bunch of wood shavings on the floor just seems right. Working with cherry is a lot of fun. I enjoy seeing a master wood worker with hand tools. A lot of great hand tool work with a wonderful out come. Thanks for sharing you work process. Like Dave P. commented above your blue tape technique is something I can use on one of my future projects. 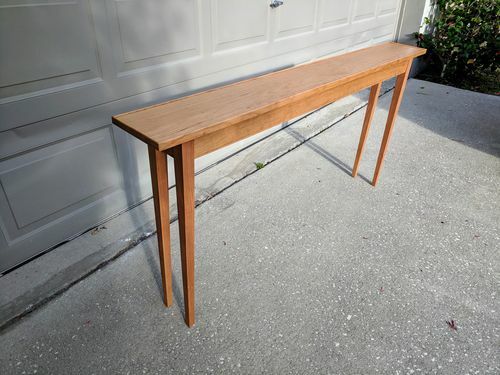 A nice slender looking table. I really enjoyed all the build photos. Thanks for sharing those.